Edited by Alexander N. Chumakov, Ilya V. Ilyin, Ivan I. Mazour. Leiden; Boston: Brill, 2017, 722 pp. This book is a translation from Russian into English, a substantially revised and expanded edition of the Encyclopedic Handbook of Global Studies published in Russia in 2012.1 The publication of this book is the natural result of extensive work by an international creative team, over the course of the past twelve years. This reference volume is also an integral part of a larger research and publishing project, the origins of which date back to the end of the twentieth century, when the global and Russian academic community formed a new interdisciplinary field – globalistics. A priority was to make an inventory of creative ideas, generalize them and order them according to good practice approved knowledge accumulated in globalistics to date. Typically, such problems are solved by the publication of reference books. This task was entrusted to the Russian Philosophical Society, the Russian Academy of Environment, Centre of Science and Applied Programs Dialogue, the international public organization Concerned Philosophers for Peace and the Project Paideia of Boston University (usa), which embarked on the preparation of the international interdisciplinary encyclopedia Globalistics. The main objective was to compile and organize the most important theoretical results obtained to date in research into globalization processes and their possible consequences. The encyclopedia, prepared by 450 of the most renowned experts from 28 countries, was published in 2003 in Russian and English, and became the first reference book in the new interdisciplinary field of globalistics. 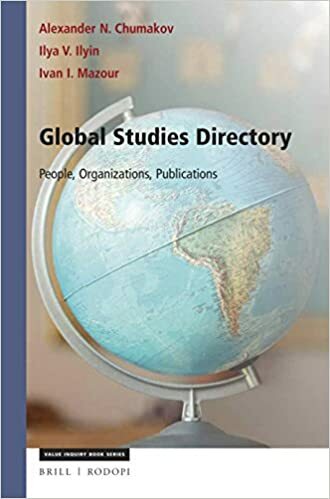 This publication is the first example of an edition designed both for specialists and anyone interested in the development of the modern global world, global processes and specific outcomes that have accrued in the field of globalistics. Volgograd: ‘Uchitel’ Publishing House, 2017. – 400 pp. The scope of human thought along with its ability to proceed from reconstruction of the most ancient periods to anticipation of the distant future, from small objects to galaxies and the Universe as well as, to embrace different trends and dimensions of reality never ceases to amaze us. You are reading a new issue of the Yearbook which contains some ‘grains’ of the description of the billion years' path. This Yearbook presents the global studies which cover different fields of research. The present volume is the sixth in the series of yearbooks with the title Globalistics and Globalization Studies. The subtitle of the volume is ‘Global Evolution, Historical Globalistics and Globalization Studies’ which reflects the contents. The present issue brings together a variety of contributions devoted to mega- and global evolution (Part I); historical globalistics (Part II); globalization and glocalization (Parts III–IV). Besides, Part IV comprises some issues on the view in the future. We become more and more accustomed to think globally and to see global processes. The yearbook will be interesting to a wide range of researchers, teachers, students and all those who are concerned about global issues. Springer International Publishing, 2016, 256 p.
This thought-provoking monograph analyzes long- medium- and short-term global cycles of prosperity, recession, and depression, plotting them against centuries of important world events. Major research on economic and political cycles is integrated to clarify evolving relationships between the global center and its periphery as well as current worldwide economic upheavals and potential future developments. Central to this survey are successive waves of industrial and, later, technological and cybernetic progress, leading to the current era of globalization and the changes of the roles of both Western powers and former minors players, however that will lead to the formation of the world order without a hegemon. Additionally, the authors predict what they term the Great Convergence, the lessening of inequities between the global core and the rest of the world, including the wealth gap between First and Third World nations. This special issue of the digest ‘Age of Globalization’ is devoted to The XXIV World Congress of Philosophy (held at Peking University, Beijing, August 13–20, 2018 and includes contributions authored by world renowned experts in the field of globalization and Global Studies representing different countries. Many of these authors also contribute to the Russian original journal entitled Vek globalizatsii (‘Век глобализации’) which comes out on a quarterly basis since 2008. It is currently among the leading scientific and theoretical journals addressing the main global issues and it has received a wide acceptance and recognition in the Russian-speaking countries. Its special issues in English, including the present one, are published on the occasion of important events in the field of global research. The contributions to the present issue span a broad range of aspects of modern Global Studies and global trends. Meanwhile, two factors have influenced the selection of articles for this special issue: the interdisciplinary character of Global Studies as a field of scientific knowledge and the fact that this issue is devoted to the forthcoming philosophical congress; thus, the articles focus on philosophy while their subject matters and theoretical frameworks are closely related to philosophy. In line with the broad theme of the issue, the contributions to the first section ‘Theoretical Issues of Globalization’ focus on different worldview, methodological, historical and cultural and civilizational aspects of modern Global Studies. The second section ‘Globalization and its Consequences’ comprises articles addressing globalization processes unfolding in different spheres of natural and social life as well as their particular manifestations in society of which a vivid example are the global problems humanity currently faces. Finally, the third section ‘Nature, Society, and Human’ presents the results of global investigations related to human spiritual, in particular, religious life, international relations, education, social and economic development, problems of terrorism, etc.